Rivers of light might be seen as a companion piece to Northern Lights and, indeed, it revisits some of the same ideas. It has a similar folk-song opening—this time from the Sámi people of Scandinavia (the piece was commissioned by the Swedbank Choir in Riga, Swedbank being a Swedish bank with a big presence in Latvia). 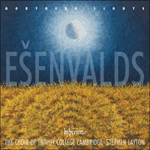 This is eventually combined with another Sámi folk song for a male voice over another of Ešenvalds’ ‘eternal’ chorales, and the words of the explorers Fridtjof Nansen and Charles Francis Hall also appear in a kaleidoscope of texts that facilitates a sustained but varied musical vision of light—specifically the Northern Lights—in its many forms. sira ria, sira siraa ria. Winter night, the sky is filled with symphony of light. The sky is flooded with rivers of light. Ah, the doors of heaven have been opened tonight. From horizon to horizon, misty dragons swim through the sky. Green curtains billow and swirl. Fast-moving, sky-filling, the tissues of gossamer. of glittering silver—changing now to yellow, now to green, now to red. into many folded bands of silver. It shimmers in tongues of flame. of departing soul in the moonlight. Ah, leaving a glow in the sky like the dying embers of a great fire.